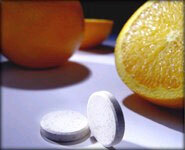 Science Project _ Vitamin C. Which fruit contain the most vitamin C? Vitamin C is an important anti-oxidant, helps protect against cancers, heart disease, stress, it is part of the cellular chemistry that provides energy, it is essential for sperm production, and for making the collagen protein involved in the building and health of cartilage, joints, skin, and blood vessels. Vitamin C helps in maintaining a healthy immune system, it aids in neutralizing pollutants, it is needed for antibody production, it acts to increase the absorption of nutrients (including iron) in the gut, and it thins the blood. Just to mention its most important functions. How does the amount of vitamin C change when fruits get older? How does the storage temperature affect the amount of vitamin C in fruits? How does cooking affect the vitamin C in foods? More details or support for this project is available for the members of ScienceProject.com web site. Material needed for your experiments may be obtained locally or purchased online at MiniScience.com.